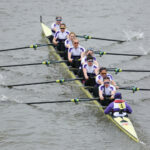 The University of London won three events on Sunday afternoon at Henley Women’s Regatta, to secure a 22nd year straight of wins at HWR. World U23 Champions Charlotte HODGKINS-BYRNE and Lucy Glover (Edinburgh Uni.) teamed up to take victory in Championship Doubles in emphatic style. 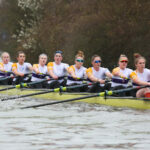 UL’s Oonagh COUSINS and Ellie STEWART formed part of a GB Development Eight racing in Championships Eights, beating Yale University in the final to take victory. COUSINS joined UL in September 2017, having never raced at HWR before. UL also had a Championship Quad and Championship Four racing on Sunday, after every UL athlete racing on Saturday won. Marlow Regatta at Dorney Lake also took place this weekend. There were close 2nd places for our top boats in Championship Coxed and Coxless Fours. The UL Temple Eight posted the fastest ever time for a UL 2nd Eight, and the UL 3rd Eight took victory in the Uni/College Eights category. UL athletes were also racing at World Cup II in Linz, Austria. The GB Women’s Eight containing UL’s Sara PARFETT and coxswain Matilda HORN took 4th in the A Final. Ollie COOK took 5th overall in the Men’s Pair. 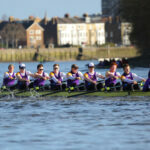 There are a number of events taking place at HRR this year for alumni and friends of ULBC. Click here for details. The 1968 UL Grand winning & Mexico Olympics crew will be rowing over during the Saturday lunch interval. The 1988 UL/Leander composite Grand winning Olympic crew will be rowing over during the Saturday tea interval.